All standard matt laminating pouches are supplied with a free card carrier for use with machines that require them. Matt laminating pouches are designed to enhance, protect and preserve your documents. Our high grade matt laminating pouches & ultra matt laminating pouches come in various sizes from Credit Card right up to A2, A3 & A4 size and are available in 5 thicknesses: 150 micron, 200 micron, 250 micron, 350 micron and 500 micron. All A1 laminating pouches are supplied with a free card carrier for use with machines that require them. Laminating pouches are designed to enhance, protect and preserve your documents. All standard gloss laminating pouches are supplied with a free card carrier for use with machines that require them. 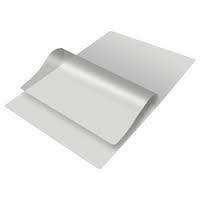 Laminating pouches are designed to enhance, protect and preserve your documents. Our high grade glass clear gloss laminating pouches & ultra gloss laminating pouches come in various sizes from Credit Card right up to A2 size and are available in 5 thickness 150 micron, 200 micron, 250 micron, 350 micron and 500 micron.